An exclusive glimpse behind the scenes! Get exclusive access to see behind the scenes at Tynecastle Park. We will reveal the inner workings of the Club in a fun and informative way; see where the players get changed on match day and experience the emotive run out of the tunnel. Have your picture taken at the media board, where the man of the match gets presented with champagne! Go pitch side, sit in the press seats and stand where the manager stands on match day, at the dugouts. Our family friendly tour is great for sports fans of all ages. The fully guided tour will last approximately one hour and customers will have access to the Clubstore afterwards. 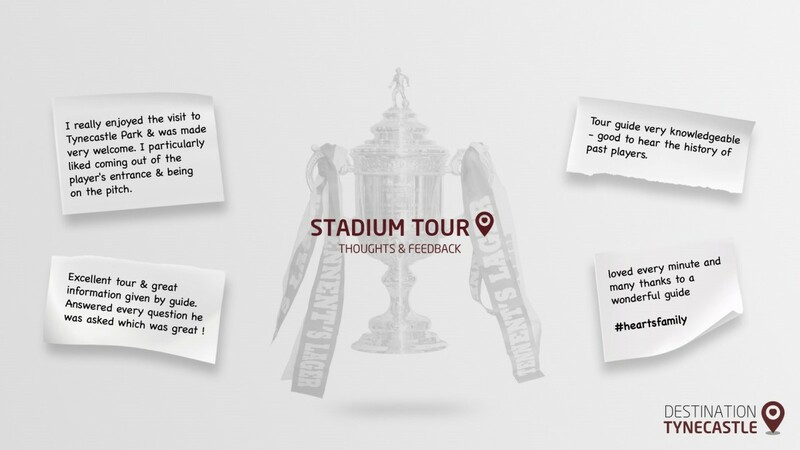 The meeting point for the Stadium Tour is inside the Heart of Midlothian Museum, which is located at the Tynecastle Terrace entrance (just off Gorgie Road). We encourage tour customers to arrive early to spend a little time taking in the Museum exhibitions. The tours are currently available online only.